Sen. Orrin Hatch (R., Utah) on Thursday night slammed Obamacare supporters by calling them the "stupidest, dumbass" people he's ever witnessed. Hatch was speaking at the American Enterprise Institute about the Republican tax overhaul, passed in December, when he mentioned the "wonderful bill" called Obamacare, or the Affordable Care Act. 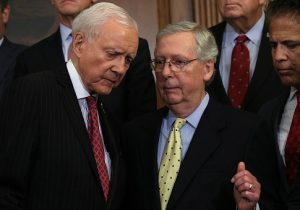 "[We] finally did away with the individual mandate tax that was established under that ‘wonderful bill' called Obamacare," Hatch said. "Now, if you didn't catch on, I was being very sarcastic. That was the stupidest, dumbass bill that I've ever seen." "Some of you may have loved it. If you do, you are one of the stupidest, dumbass people I've ever met. There are a lot of them up there on Capitol Hill from time to time," Hatch added. He went on to describe Obamacare as one of the most "regressive taxes" in the tax code due to low-income families "paying most of the freight," according to CNN. He argued that eliminating the individual mandate in the new tax law was a major step forward in the ongoing effort to repeal and replace Obamacare. Hatch, who has served in the Senate since 1977, announced at the beginning of the year he would retire and not run for reelection in 2018. His retirement opened the door for 2012 Republican presidential nominee Mitt Romney to run for the seat, a move Hatch said he would support. Romney officialy announced his candidacy in February. UPDATE: 4:23 P.M.: Hatch tweeted out an apology for his remarks.